Today I’ll be showing you how to crochet a very simple phone case using one of the most alluring and extraordinary crochet stitches. Crochet phone cases, also frequently called crochet cell phone cozies, are very fun and easy to make little projects. They are quite useful and can incorporate both simple and advanced stitches. However, the main reason I’m sharing this pattern with you is not a phone case but this adorable banana stitch. To be honest, I have never seen such a lovely and extraordinary stitch before and I’m definitely looking forward to making many other crochet projects with this lovely technique. So, if you like this banana stitch as much as I do, just follow these easy instructions and make the most amazing projects with the most eye-catching crochet stitches. Enjoy yourself and always feel free to share your opinion and ideas with us. 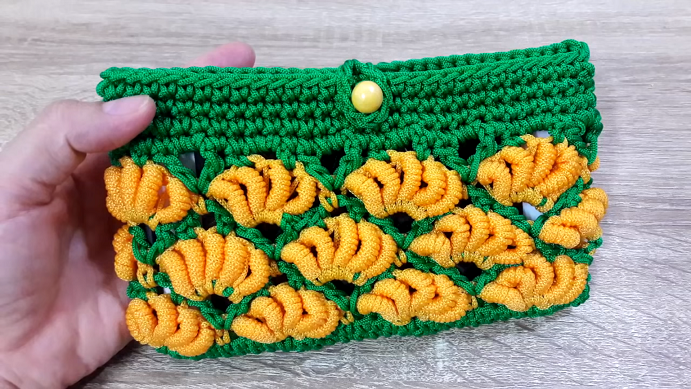 This is a simple crochet banana stitch phone case tutorial that incorporates two beautiful crochet stitches, the bullion stitch and the banana stitch. You might also like this easy to follow tutorial on how to crochet a bullion stitch.